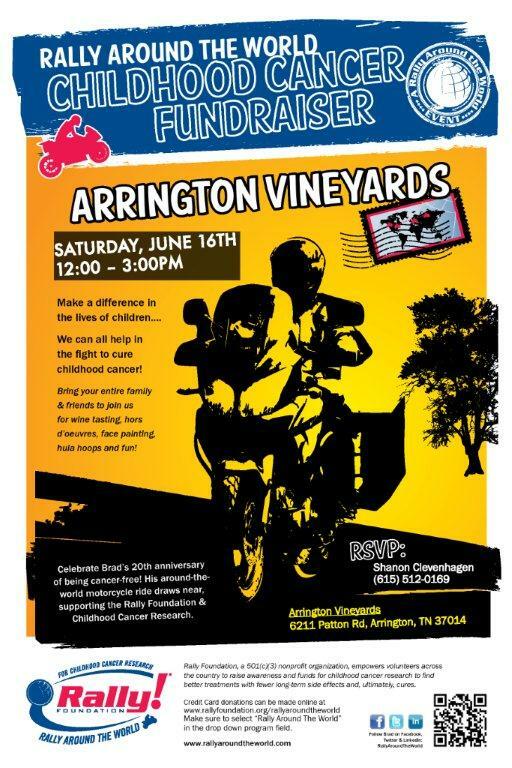 Please join Shanon & Brad as they celebrate Brad’s 20th anniversary of being cancer-free and he prepares for an around-the-world motorcycle ride supporting Rally Foundation & Childhood Cancer Research at Arrington Vineyards on Saturday, June 16th from 12 – 3pm. The struggles these children endure reach far beyond the personal challenges Brad will face on his 14,000 mile ride…we can all help in this fight to cure childhood cancer. Be a part of making a difference in the lives of kids…bring your entire family & friends and join us for some wine tasting, hors d’oeuvres, face painting, hula hoops and some fun. Don’t forget your chairs and blankets as we enjoy some beautiful Tennessee countryside. Your donations are welcomed…help us win the fight against childhood cancer! This entry was posted in Cancer Survivors, Rally Around the World, Rally Sponsoring Friends and tagged Arrington Vineyards, Cancer Fundraising, DL650 by rallyaroundtheworld. Bookmark the permalink.